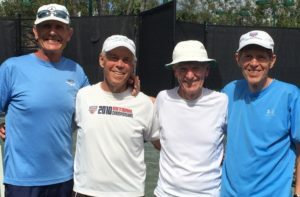 In between the two Sarasota tournaments last week and next week playing with Hank Irvine, this weekend was the Pelican Bay Doubles Club Championships, where I was teamed with good friend Bob Wilkie. While there were just five teams entered in the Open Division, they were all tournament-level teams, ranging in age from mid-forties to mid-seventies! As usual, there was a “surprise” team entered (usually a renter, family visitor, someone’s son/grandson, etc.). This year, it was the team of Frank Wilshire (40 something?) and owner/two-week-visitor from Switzerland Roger Bollinger. On Saturday, we played a round robin format of one regular-scoring set (with tie break at 5-5) vs. each of the other four teams – starting at 8:00 am in the early morning. The two teams with MOST GAMES WON would then move forward to the finals on Sunday. At the end of the third round, the teams of Wilkie/Wachtel + the two younger “surprises” both had won all three of there “matches” and had 18 games. Lurking behind was the solid team of Minnesota’s own Tony Williams and Rick Schultz with 15 games won. So, doing the math before going on the court vs. the young guns, I determined that (even if Williams/Schultz won six games in their last round) we had to win at least three games to move onto the finals. 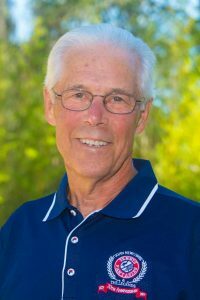 We split the first two games and Bob was serving at ad in when the youngest guy in the tournament pulled up lame, with severe muscle cramps in both calves. We offered him time to recover; but they decided to default the match. The tournament awarded them the one game they won (and gave us just two? ); so they now had 19 games won. Williams/Schultz were playing the tough team of Tom McCune and Jack Moore and – needing five games to get to the finals on Sunday – were down 2-4. But they rallied to take the last four games for a 6-4 victory and 21 total games. Under sunny, warm skies, Bob and I took to the courts vs. Tony Williams and Rick Schultz (who had had a strong Saturday: winning their first match’s 5-5 tiebreaker; losing to us in a 5-5 tiebreaker; losing to the “young team” 6-4; and winning their last match 6-4). Our plan was to stay offensive the whole match, come forward and control the net. With a crowd of 40-50 watching, we had good, close points, close games; but Bob and I were able to stay in control and won in straight sets. Next: USTA tournament at the Meadows in Sarasota with Hank Irvine. To see the seeds, draws and matches, just click HERE.